First up, let me make a full and proper disclosure, plus an apology to the Star Trek fans. I didn’t watch your show when I was growing up. That’s not to say it isn’t cool. It’s just that I lived in country towns until I was a teenager, and TV stations were limited to just two–a national broadcaster and a commercial channel that picked up stuff on the cheap, rarely anything good. Alas, there was no cable with classic shows on endless repeat, or the internet, this being back in the Dark Ages. The loss is mine. I’m aware of this. Second, let’s acknowledge that creative theft is totally okay for something like d-mat, as it is with spaceships and time machines and rayguns or whatever. Matter transmitters have been around since the late nineteenth century (long before “Beam me up, Scotty”). They’re not owned by anyone. More to the point, they’re used so often in stories, novels, TV shows, movies and computer games that there’s always going to be someone inspired to do something new with them. And there are always new stories to tell. That’s the great thing about science fiction. Reinvention is the name of the game. All that said, here are some TV shows and moves that I particularly loved when I was growing up, all of which used the idea of d-mat (or something very much like it) in ways I found fascinating, and which led after long years of thought to Twinmaker. When you think about it, the TARDIS is a space machine as well as a time machine. It dematerializes and rematerializes, it takes the Doctor and his companions to other places, it doesn’t actually cross the space between, it looks a bit like a booth–but this isn’t why I like to point at Doctor Who as the show that first hooked me up to the d-mat train. 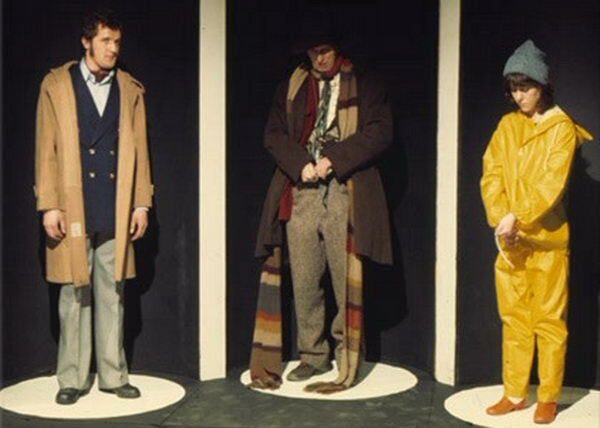 Way back in 1975, episode one of “The Ark in Space” saw Sarah Jane Smith beamed around a space station and ultimately stuck in cold storage wearing different clothes. This was an unscrewed space station, mind, with no evidence of robots, so the change in wardrobe could only have happened in transit. No one remarks on this, but it sparked a thought: if a matter transmitter could change Sarah Jane’s outfit, what else could it do? A gritty, bleak version of Star Wars, in which the heroes are dysfunctional terrorists, this show has been a huge influence on my work (see here for an early example). It also had a teleporter that sounded like a coin spinning down a drain, which for some reason appealed. Alfred Bester first called teleporting jaunting back in the 1950s (in The Stars, My Destination) and Stephen King used the term too, but I knew it first from this old TV show, now being remade for the US audience. They were dorky kids who could do cool stuff. Of all their gifts, I wished I could jaunt most of all. Like Jumper but in flares. I must have been around 11 or 12 when I caught this classic movie late one night on the tube. I didn’t know that it had started life as a famous short story, that it had been made in 1958, that it spawned a bunch of crappy sequels, or that the catchphrase “Help me! Help me!” was famous. I was simply hooked, from the gruesome crime scene at the beginning right through to the infamous ending. It blew my mind. This is what matter transmitters could do. Forget moving stuff around: let’s turn people into monsters! As well as a bunch of crappy sequels, The Fly spawned a not-crappy-at-all remake. It must have been one of the first R-rated movies I saw, being all of 19 years old at the time, and it seduced me all over again. By then I’d seen the original many times and read the short story as well. I’d been giving the idea a lot of thought. What David Cronenberg’s remake demonstrated was that this old idea could be used in a way that was culturally relevant today. A fear of technology has always been at the forefront of d-mat-gone-wrong stories, as has body horror, in which someone who uses d-mat become the monster. But here the trope was used as a metaphor to examine natural processes like ageing and disease. Forget monsters: real life is where real fear lies . . .
SF is all about re-inventing what has been before. I loved Twinmaker and the idea of d-mat (i’ll be honest, it’s the first time i’ve read anything like it, but of course i’ve seen star trek, star wars etc etc). It leaves me fascinated even more after reading TwinMaker, and I think I’ve now found a new obsession to study and research! I’ve always been interested in writing Fantasy, and never really thought about writing SF, but love what you did in this novel bringing all this future technology to a world so vastly similar to our own. Makes me wonder what developments will be made in the future in real life (as goggle glass already seems to be developing interesting things).